This U.S. Mint numismatic sales report covers the week ending October 15, 2017—a quiet sales week with no new releases. The list of best-selling items saw few changes from the prior period, and indeed has remained constant for weeks. Once again, the 2017 Proof Set (17RG) was at the top of the list, with 13,475 units sold. The 2017 Silver Proof Set (17RH) and Uncirculated Set (17RJ) traded places: the Uncirculated set came in second, with 4,577 units sold, while the Proof Set was third, with 4,111 units sold. The 2017 American Eagle 1-ounce silver Proof coin (17EA) was fourth, having sold 2,285 units. The 225th Anniversary Enhanced Uncirculated Set (17XC) sold 1,586 units, which moved it from sixth place to fifth. The 2016 Limited Edition Silver Proof Set (16RC) continued to enjoy improved mileage by drafting behind the (now unavailable) 2017 LESPS. In the previous report, we noted a large bump in sales of the 2016 LESPS, in part due to general increased interest in the sets, and in part due to mis-purchases by collectors who believed they were buying the 2017 set (with its low-mintage American Eagle silver Proof coin from the San Francisco Mint). After weeks of selling in the low 200s, the 2016 LESPS jumped to 990 units sold in the prior period. For the current report its numbers are even stronger: with 1,175 units sold, it finished sixth in the sales ranking. The remainder of the top 10 filled out as follows: in the seventh spot, the 2017 American Eagle 1-ounce Uncirculated silver coin (17EG), with 934 sold; in eighth, the 2017 America the Beautiful Quarters Proof Set (17AP), 593 sold; ninth, the 2017-P American Liberty silver medal (17XB), 500 sold; and in 10th place, the 2017 American Eagle 1-ounce Uncirculated gold coin (17EH), with 448 units sold. The 2017 America the Beautiful–Ellis Island Three-Coin Set (17AG) dropped from the top 10 to the bottom of the list, netting -132 sold. The 2017 Limited Edition Silver Proof Set showed a negative figure (-25) as well, thanks to product returns. The 2016 Uncirculated $1 Coin Set (16RB) was also adjusted a bit downward (-11), and a few other coins had slight downward adjustments. One item is newly unavailable on the Mint’s website: our 10th-best-selling product, the 2017 American Eagle gold 1-ounce Uncirculated coin (17EH). Its last known sales figure is 5,768. No items that we are aware of have been newly removed from the Mint’s website, and none have been moved off the Mint’s report. 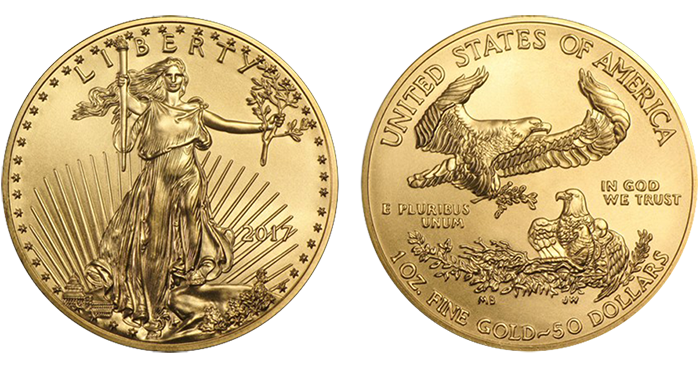 Coin Update sponsor APMEX currently stocks the 2017-W Uncirculated AGE and other American Eagle gold coins. There will be one new item on next week’s sales report: the American Liberty 225th Anniversary Silver Four-Medal Set (17XD), which goes on sale at noon (ET) tomorrow. The set contains four .999 silver one-ounce medals (2017-S, Proof; 2017-P, Reverse Proof; 2017-D, Uncirculated; and 2017-W, Enhanced Uncirculated), and is priced at $199.95. Check out the third edition of MEGA RED, with 1,504 pages, 8,200 listings, 7,000 images, 15,400 auction records, and more! 17XD Am. Liberty silver four-medal set To be released October 18, 2017. I love these mint reports. A lot of info in a few clicks. Plus other story lines also. I miss having this feature updated weekly as it was in the past. It looks like the Mint is still producing a weekly report (https://www.usmint.gov/about/production-sales-figures/cumulative-sales), so I hope this doesn’t mean that Coin Update has decided to do away with the feature. I agree with JR above. Please bring the report and commentary back. Miss these!